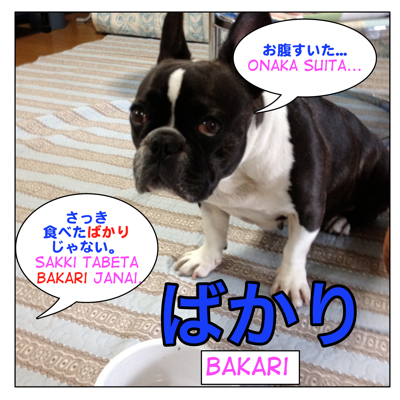 the verbs you can use 〜 たて ( = tate) are limited and if it doesn’t work, use ～ばかり ( = bakari). = (Serving food) Here you are. = Ie kekkou desu. Ima tabeta bakari nanode. = Shiken ga owatta bakari desu. =I just finished an exam. = Maggie wa wakareta bakari da. = Maggie just broke up. = Kare wa ima okita bakari dakara kigen ga warui. = He just woke up so he is in a bad mood. = Nihon ni kita bakari no koro wa nihongo ga mattaku hanasenakatta. = When I just came to Japan, I didn’t speak Japanese at all. = Ano kurasu ni wa kawaii onnanoko bakari iru. = There are only cute girls in that class. = Monku bakari itte inai de hataraitara? = Quit complaining and start working! = Okane bakari ga subete dewa nai. = Money is not everything. = Amai mono bakari taberu to futorimasu. = If you only eat sweets, you will gain weight. = Onaji machigai bakari shiteiru. = I’m making the same mistakes over and over. = Ishuukan mae ni atta bakka (or bakkari) de kare ni deito ni sasowareta. = We just met a week ago and he asked me out on a date. = Kawaii ko bakka ni yasashiine. = You are nice to only cute girls, aren’t you? = Watashi wa inu bakari dewa naku neko mo suki desu. = Not only do I like dogs, I also like cats. = Kare wa nihongo ga hanaseru bakari dewa naku kanji mo takusan shitteiru. = Not only does he know how to speak Japanese but he also knows a lot of kanji. = Maggie sensei wa inugo bakari ka nihongo mo hanaseru. = Not only does Maggie Sensei speak dog language but she also speaks Japanese. = Hyakuman en bakari mouketa. = I made about one million yen. = Nijikan bakari de tsuku to omoimasu . = I think we will be arriving in two hours or so. = Sennin bakari no hito ga atsumatta. = About one thousand people gathered. = Maggie wa nete bakari iru. = Maggie is always sleeping. = Asonde bakari ite wa ikemasen. = You can’t just play all the time. = Itsumo Maggie ni gochisou ni natte bakari imasu. = Maggie always treats me. Note : This form is usually use to describe one’s habitual behavior/actions. = Hito ni tayoru bakari no jinsei dewa ikenai. = We shouldn’t just depend on someone in life. = Kanojo wa nani wo itte mo naku bakarida. = Whatever I said, she was just crying. = Kare wa jibun no jimanbanashi wo surubakari de hito no hanashi wa nani mo kikanai. = He always brags about himself and never listens to others. = Monogoto wa kore kara yoku naru bakari dato omoitai. = I want to believe that things can only get better. = Musume no shiawase wo negau bakarida. / All I wish for is my daughter’s happiness. = Ato wa kabe ni penki wo nuru bakari da. = All we need to do now is to paint the wall. = Yatto subete no ryouri ga dekita. Ato wa shoutaikyaku ga kuru no wo matsu bakarida. = I just finished all the cooking now. All we need to do is just to wait for the guests. Let’s see you can tell the difference between following sentences. = Maggie just had a snack. = Maggie wa oyatsu bakari tabete iru. = Maggie only eats a snack. = Maggie wa okashi wo tabete bakari iru. = All Maggie does is eat a snack. = Ano hoteru wa takai bakari de sabisu wa saitei datta. = Although the hotel was expensive but the service was horrible. 5) to give a reason, just because someone did something+ unpleasant thing happened. You did something and it leads to a negative consequence. = Kare no iu koto wo kiita bakari ni hidoi me ni atta. = I got in a big trouble just because I listened to him. = Paatei ni itta bakari ni aitaku nakatta hito ni atte shimatta. = Because I went to the party, I saw (I ended up seeing) someone I’d been avoiding. = Se ga hikui bakari ni moderu ni narenai. = Just because I am short, I can’t be a model. = Since I am too beautiful, I made many men suffer. = Mou ryouri wa atatameru bakarida. = The food is just need to be heated up. = Ato wa Maggie no kaeri wo matsu bakari desu. = I just wait for Maggie to come home now. = Maggie sensei wa ningen dato bakari omotte ita. = Nihongo wa motto muzuashii mono da to bakari omotteita. = Tada de moraeru mono dato bakari omotte itanoni…. = Kanojo wa kono toki to bakari ni fuman wo buchimaketa. = She took advantage of the opportunity to vent her frustration. = kokozo to bakari ni shashin wo ippai totta. = I took a lot of pictures taking advantage of the opportunity. = Kare wa mou kono ken wa oshimaida to bakari ni wadai wo kaeta. = He changed the subject as if to say the case was over. Describing someone’s action assuming their feeling or what they are trying to say. = Kare wa subete wo shitteiru to iwanbakari ni watashi wo mita. = He looked at me as if to say he knew everything. = Gomennasai to iwan bakari no kanashii kao. Here are more examples with other verbs. = Ima ni mo nakanbakari no kao. ~そう ( = sou) is conversational and んばかり ( = nbakari) is more literal. = Doggufuudo bakari dewa naku tamaniwa oishii karaage mo tabesasete. = I hope you don’t just give me dog food but let me have some delicious fried chicken once in a while! Special Note for French Speakers. Your friend, Marianne translated this lesson in French. I posted on my Facebook page. Thanks Maggie sensei so much! (1) 子供は泣いているばかりです。 talking about the particular time when the child keeps crying. (2) 子供は泣いてばかりいる。 The child always cries. The only thing I do is praying for her happiness. / I have been constantly praying for her happiness. (1) てばかりいる and 2)ばかりでなく to say、 for example this sentence. Not only does Maggie sensei just always sleeping but also she teaches Japanese. It is not natural to combine two ばかり in one sentence. isn’t that both are translated to “Just did something” ? They are interchangeable when you talking about the action which someone just did. I just came back home now/a little while ago. I just went to Japan last year. Your site is always helpful for my studies. Hi maggie sensei. This may be out of the context but, why is “de” used after bakari? Thank you so much for explaining every way of using bakari as I’m always confusing myself on how to use T_T Japanese has so much nuances that can’t really differentiate with English! The examples are also very useful, thank you so much! If you get confused, just come back again. And feel free to ask me questions here. Though my English translation does’t have the word, just/only, the sentence emphasize the meaning. Let me add “just” in the translation for you. Just making the same mistake over and over. * 時間ばかりかかる仕事 = The work which just taking a lot of time. 甘いものを食べてばかりいると*太ります。If you just eat sweets, you will gain weight. 甘いものばかり食べると*太ります。 If you eat just sweets, you will gain weight. 食べたら　If you eat just sweets, you will gain weight. Hi, Maggie-sensei! I came here to understand why bakari was being used with de and though I noticed that in all the example os the section named below use bakari accompanying de, I became confused when I noticed it appears in other sections as well. Why and when is de used? De is always giving me a headache. Let’s forget about ばかりで now. When you connect two sentences, instead of saying そして ( = and) you can connect them by changing the first verb into this form. = Kore wa watashi no hon desu + Are wa Maggie no hon desu. = This is my book. + That is Maggie’s book. = Kore wa watashi no hon de are wa Maggie no hon desu. = This is my book and that is Maggie’s book. Just before this sentence, it is about something that he regretted. Can I translate it to “He keeps/is always talking about/repeating this (something he regretted).” ?? It means He just talking about that. From just that sentence, I can’t see the “regret” part. The sentence of regrets comes right before this, so that’s why I assumed the person keeps talking about his regrets. So based on your analysis, I believe it means “He has repeated saying about this (which is likely his regrets)”, correct? Hi Maggie Sensei, I am confused with this two. What is the difference? look similar to me except one uses て while the other use plain form. You can’t just play all the time. We shouldn’t just depend on someone in life. In the following pattens you can use them in the same way. He does nothing but crying. You have to use て form. The second example can be replaced. You can say 頼んでばかりの人生 as well. Hello! Thank you so much for your lessons! They’re always so detailed and I learn a lot. Although I’ve read this one as well, I came across a sentence which I can’t totally get the meaning of ばっかり. The sentence is ‘将来、デビューしたいけど、もしできなくても悲観ばっかりはしないです’. Does it mean something like ‘I want to debut in the future but, if I’m not able to, I won’t be disappointed.’? Even though this lesson was really helpfull! So the person says he/she just writes what he/she likes on his/her blog. But he/she wants you to visit. Maggie, I found in my grammar book (ばかりに lesson) an idiom and I don’t know, if I translate it correctly. I think 男の風上にも置けない奴 = He doesn’t desire to be called a man / It’s a shame to called him a man / He is not to be treated as a man / He is just a disgrace to the man. Which translation fits here (in this sentence) the best, in your opinion? Your translation of 風上にも置けない is correct. Usually 男の〜、人の〜 and it describes a despicable person who takes advantage of others. I really appreciate that I can always count on you! sensei I heard te/de+bakari is used to express a complaint usually is that true? te/de bakari / noun bakari tend to express complaint because when a person only does something, other people may get annoyed, right? Ex. 彼女は文句を言ってばかりいる。She is always complaining. Ex. 彼はおしゃべりばかりしていて何も仕事をしていない。All he does is chatting and he doesn’t do any work. But it is not always used to express complaints. Ex いつも頂いてばかりですみません。= I am sorry I am always getting something from you. お久しぶり、マギー先生！ I have a few questions. Why did you use で instead of なのに in these sentences? 2. How would you translate this sentence (from the comments)? このレストランは安いばかりです。 “This restaurant is just cheap”? Isn’t that a good thing, though? It sounds odd, as if the sentence was incomplete. Why is it 降り出さんばかり, and not 降りだせんばかり? 1. ばかり and ばかりで　：で has a function of giving a reason so ばかりで is used when you continue the sentence. (な)のに means “although/though/even if/even though” and you have to give the contradicted result. 2. Isn’t that a good thing, though?→Not necessary. Even if the restaurant serves cheap food, what is the quality of food is bad, the service is horrible or dirty? I’m very happy to hear you like our site. two ばかり in one sentence??? So you want more examples with these patterns? Sure. = All the students in my class are funny. = He does nothing but sleeping. = I just came back home and I haven’t prepared dinner at all. = My mother looked at me as if she knew everything. = Maggie Sensei nodded as if to say “Everything is all right”. Hello, I found a sentence with some sort of interesting(at least for me) ばかり usage -「 あたしは、形とばかり並べられた陶器のティーセットに手を伸ばす。」, I understand that the meaning would be something like “the teacups was lined up just for show”, but what is the point of putting と before ばかり in this case, can you please explain this part to me? Thank you very much! I guess the writer used と just to emphasize the meaning. Thank you!! I thought about adding the information the other day and totally forgot about it. Will add it sometime soon. thank you for the lesson maggie sensei! somehow i wonder is there any relation between ばかり　and ばっかり? Is it the same or like, the former one is more formal while the latter is just the speaking accent? I will add that information. Yes, you have to practice a lot to get familiar with ばかり. Ah good point. Usually ん is used for a casual contraction but n+bakari is a literal expression. You may not hear often in everyday conversation but you will see in the writing form more. Oh so it is more likely to see “n+bakari” used in writing, more so than in conversations. You can impress Japanese people for sure! I guess that it looks more or less like the category 2. Good! I added adjective + ばかり. As for your question, although they are not exactly the same, they could be interchangeable if you change a little. Shouldn’t the second sentence end in: “bakari iru”? Do the 2 verbal form you explain in section 4 (verb in て form and plain form) can be used interchangeably?